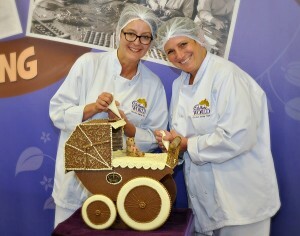 Cadbury World’s team of in-house chocolatiers have created an extra special carriage fit for a princess, after creating a Cadbury chocolate pram to welcome the new royal baby. Weighing over 12kg, including 10kg of Cadbury Dairy Milk and 2kg of Cadbury white chocolate, the impressive creation features intricate hand-piped decorations including fleur-de-lys and a crown finished with gold lustre, complete with a handmade chocolate teddy bear with a pink ribbon. 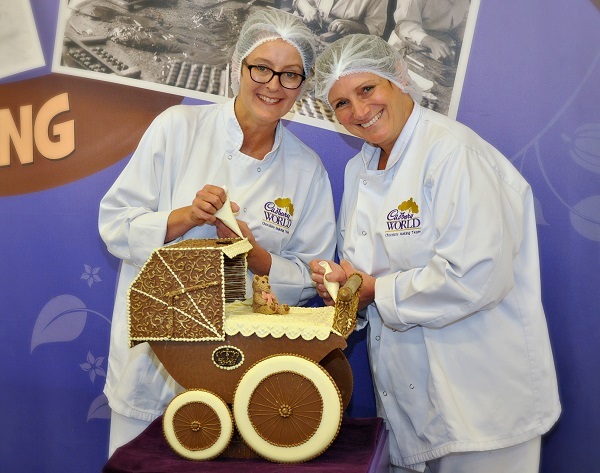 The pram, which took the chocolatiers two days to create, will be on display in the popular Chocolate Making zone at Cadbury World throughout May to celebrate the newest member of the royal family. 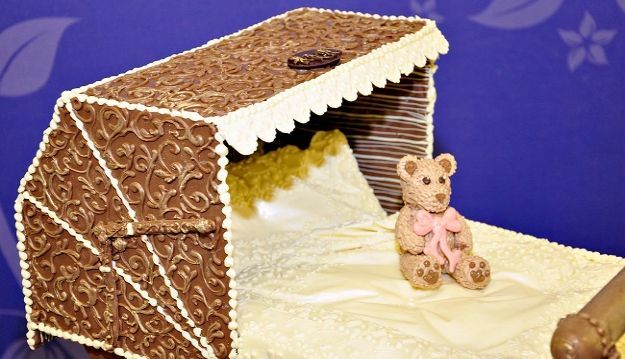 This is the second royal baby-themed chocolate model made by the chocolatiers at Cadbury World, who were also on hand to create a cot with toys to welcome the birth of Prince George in 2013. Diane Mitchell, marketing manager at Cadbury World, said: “There’s so much excitement around the birth of a new royal baby, so it’s great to be able to create something unique to celebrate! Our chocolatiers loved making the cot to welcome Prince George, so have worked really hard to create a beautiful chocolate pram for his little sister.” The creation to welcome the royal baby is just one of a series of chocolate masterpieces scheduled to be made this year, as Cadbury World celebrates its 25th anniversary. For more information about Cadbury World, or to book tickets to come and see the chocolate pram this May, visit www.cadburyworld.co.uk.